Honoring all actors who brought us everything from Blacula to Cabin in the Sky to Purple Rain to The Thing With Two Heads -- and everything in between! I read recently that the Jimi Hendrix movie featuring Andre (3000) Benjamin has been completed – for some time now, but a release date has not been given. A couple of weeks before, I read that Anthony Mackie would star in a silver screen version – and it would feature original music and…the family gave their blessings to do so. 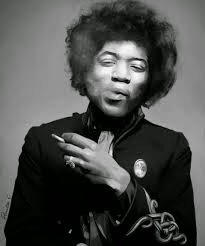 If you’re unfamiliar with the Hendrix family and why there is so much controversy, check out this article as it sheds some light as to why Black folks need to handle their business while they are alive…and sober. Courtesy of The Wrap. The Aaliyah/Zendaya situation is a non-factor since neither is/was a big deal. This is not to discredit but let’s be truthful here. And with Wendy 'How you doin'?' Williams running this, it may be laughable. Or it just may not happen since she couldn't make her own biopic (Indiewire) was never released. Speaking of Lifetime Movies, I wish the upcoming Whitney Houston biopic was a non-factor but chances are strong that all the social media scrapping is only giving the project the attention that the suits want. Dammit, she could sing before she became a wife, mother and then serious junkie who left us way too soon. So what is wrong with using an experienced director (Bill Duke, perhaps?) and a silver screen release? Does anybody know what happened to Purple Rain’s 30th anniversary? Which ol skool recording artist deserves a BET biopic? 2017. J.Swindell. Awesome Inc. theme. Theme images by rami_ba. Powered by Blogger.